The orientation of the legs of this table allows the top to be placed directly against a wall, creating a clean look. The opening near the back allows electrical cords to be elegantly swept beneath the table without clutter or hassle. 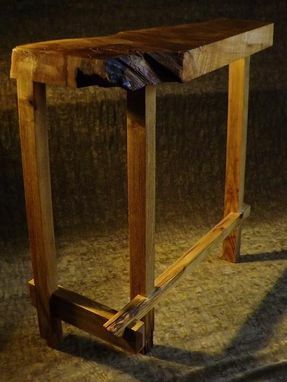 In designing this piece the orientation of the legs was decided to evoke the image of decay creeping up the table from the ground, as if the table was sitting on the forest floor.